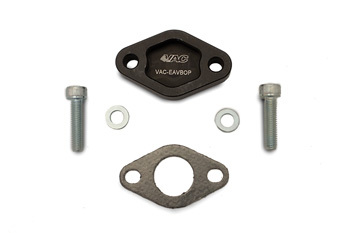 VAC Exhaust Air Valve Block Off Plate eliminates the Exhaust Air Valve/ Exhaust Gas Recirculation port on the S54, S50b32Euro, and M54 engines. It is chamfered and lapped, then black anodized. It looks great and helps to insure a leak free seal. Perfect for racing or any time you need to block off the EAV. ECU Software will be required to remove "air-pump" codes if used with stock ECU. We sell this as a race part, for off road use.